EXAIR’s Efficiency Lab is now the “award-winning Efficiency Lab”. Thank you to Environmental Protection Magazine for recognizing the value and importance of this EXAIR service. I have blogged about this many times and we continue to help customers by using our free Efficiency Lab service that EXAIR provides to customers throughout the USA. The EXAIR Efficiency Lab allows customers to send in their existing blow off device and we will test it for compressed air consumption, sound level, and force. Ideally we try to take these measurements at the same operating pressure that is being supplied in the field so that we can compare it to an EXAIR product and offer the customer the best solution, the safest solution, and an engineered solution capable of saving them money through air savings and effectiveness. 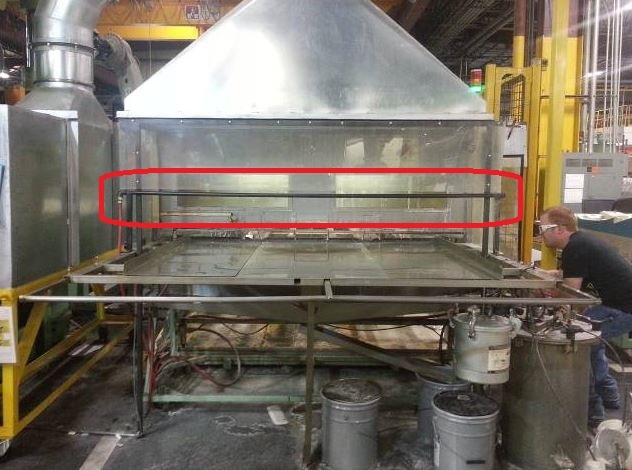 Here is a recent example of a product sent in by a customer concerned with compressed air consumption and safety of their people. The hose they sent in was actually designed to be used with liquid coolants and was a very large consumer of compressed air. A flexible blow off with .495″ openings. Designed for liquid but used for compressed air. Enormous waste of air and a huge safety risk. The hose shown above was being used at 40 psig inlet pressure. The device is not OSHA compliant for dead end pressure, nor does it meet or exceed the OSHA standard for allowable noise level exposure. The hose was utilizing 84.64 SCFM of compressed air and was giving off 100.1 dBA of sound. As seen in the chart above, an employee is only permitted to work in the surrounding area for 2 hours a day when exposed to this noise level. The amount of force that the nozzle gave off was far more than what was needed to blow chips and fines off the part. 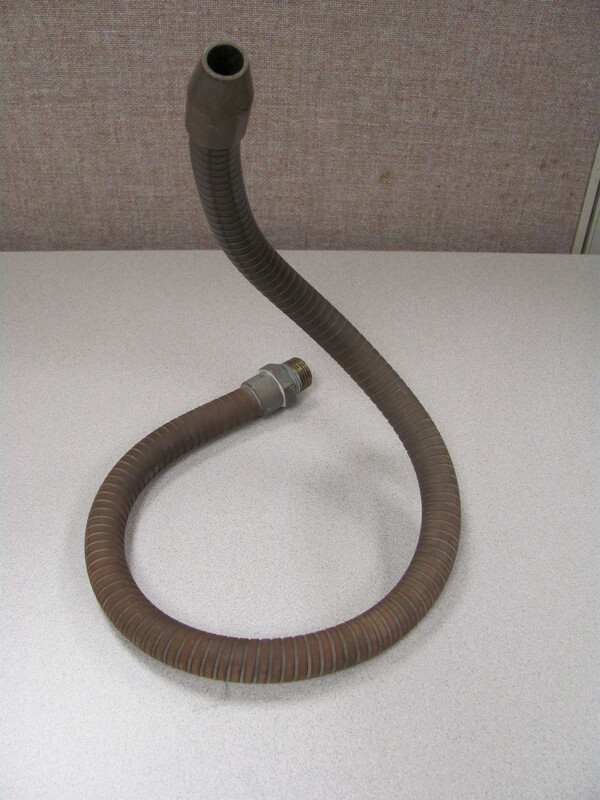 The EXAIR solution was a model 1002-9230 – Safety air Nozzle w/ 30″ Stay Set Hose. The EXAIR products were operated at line pressure of 80 psig which means they utilized 17 SCFM of compressed air and gave off a sound level of 80 dBA. On top of saving over 67 SCFM per nozzle and reducing the noise level to below OSHA standard, the EXAIR engineered solution also meets or exceeds the OSHA standard for 30 psig dead end pressure. In total this customer has replaced 8 of these inefficient lines and is saving 541 SCFM of compressed air each time they activate the part blowoff. If you would like to find out more about the EXAIR Efficiency Lab, contact an Application Engineer. We look forward to testing your blow off and being able to recommend a safe, efficient, engineered solution. Last week, I wrote about what a great idea it is to use a thermostat with a Cabinet Cooler System. I’ll let another cat out of the bag right now and tell you that there are less expensive thermostats than ours. But just like the savings you might realize on the purchase by foregoing a thermostat, using a poorly specified thermostat can also be the last savings you see. In a Cabinet Cooler System application, we’re refrigerating air. This makes for a cool, clean, and dry atmosphere for your electrical & electronic components to operate in. UL Listed & CE Compliant, EXAIR Cabinet Cooler Systems maintain NEMA 4, 4X, or 12 integrity. When the air inside the enclosure is cooled to the thermostat’s set-point temperature, it won’t shut off the compressed air flow to the Cabinet Cooler unit, resulting in unnecessary compressed air consumption. And that’s a shame. When the air inside the enclosure is heated to the thermostat’s set-point temperature, it won’t start the compressed air flow to the Cabinet Cooler unit, resulting in a potential overheating of those expensive…or critical…or both…electronic components. And that’s a REAL shame. We don’t want to see you using any more compressed air than you need to. And we SERIOUSLY don’t want to see you fry your electronics. If you’d like to find out more about EXAIR Cabinet Cooler Systems, give me a call. We have customers that call because they feel the pressure of trying to save money by saving compressed air. One such customer that contacted us for this exact reason, had an operation that was working fine, but management had to reduce cost by saving compressed air. The operation included a robotic “pick and place” machine to move sheets of corrugate from a stack to a converter machine. When they first started their operation, they had issues with the corrugate “sticking” together. The speed of pulling the corrugate from the stack would create a vacuum strong enough to pull the sheet behind it. This would cause the operation to stop. To fix this issue, the maintenance manager placed a ¼” (6 mm) poly tube at each corner of the stack to help separation. This would break the seal between the two sheets, allowing only one to be picked. The problem was solved. Or was it? Sometimes when you place a band aid on a situation, you can cause problems in other areas. The other area in this case was on the side of money to make the compressed air. More companies are trying to save money by being more efficient with their compressed air usage. The quickest and easiest way is by retrofitting open tubes and pipes with EXAIR’s Super Air Nozzles. With this application, the customer used the model 1122 Flat Super Air Nozzle. It is specifically designed to create a wide flat air stream. The tube would create a round pattern hitting a larger area than the target area. Being that the target area is just between two flat cardboard pieces, the Flat Super Air Nozzle can localized the compressed air to make it more effective. Because it was more efficient and effective, we were able to reduce the number of compressed air blowing points from four to two. For each machine, the model 1122 Super Flat Air Nozzle will save the company, 132 – 43.6 = 88.4 SCFM (3,736 – 1,244 = 2,492 SLPM) of compressed air. Perhaps you can see the savings in compressed air. But, people understand money better than SCFM or SLPM. So, let’s look at the amount of money that they will save over a year. The cost to produce compressed air is roughly $0.25/1000 cubic foot of air (This is an estimation on the average price per KWh of electricity in the U.S., $0.10/KWh). For an 8 hour operation, the yearly amount of time in minutes is 60 minutes * 8 hours * 250 days = 120,000 minutes/year. With a quick calculation, we get a savings of 88.4 SCFM * 120,000 minutes * $0.25/1000 SCF = $2,652/year per machine. If we look at the ROI for this, the model 1122 has a price of $62.00 ea. Each machine would require 2 pcs. * $62.00 = $124.00. The ROI will be about 12 days. So, when the maintenance manager asks me “How much will it cost me?”, I believe he meant to say, “How much will it save me?”. If you ever need to save on compressed air and money, you can contact one of our application engineers to help you.